School violence research papers examine the factors and causes of school violence in America. According to the Safe Schools, Healthy Students organization, the kinds and magnitude of violence encountered at school are compared to those that juveniles encounter elsewhere, and some of the effects of a range of policy changes that have been made recently are discussed with reference to the discrepancy between perceptions of the magnitude of school violence and its factual occurrence and character. 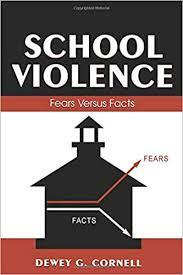 Literature on the causes of school violence, and factors contributing to, the genesis of violent behaviors is reviewed, and the main theoretical approaches to the study of school violence are examined for effectiveness. Risk factors for violence are summarized from the literature, along with suggestions for effective programs to reduce and prevent violence, and practical techniques for managing a classroom with an angry student to prevent the anger to escalate to violence. Unfortunately, the literature indicates that much of the public discourse on school violence is not informed by unbiased scholarly research and analysis. Instead, supposition and sensationalism often seem to prevail. School shootings and other spectacularly tragic incidents attract much of the attention, even though they are usually isolated and unrepresentative of conditions in the nation’s schools. In turn, the policies that emerge are often designed for crisis situations that are rarely encountered at most schools. Social Isolation research papers looks at the issue why children socially isolate themselves and why school violence and suicide are often outcomes of social. Bullying Research - Papers on bullying open up with statistics, and then discuss the emotional and physical trauma bullying can cause. Bullying in Schools Research Papers look at a sample of a paper ordered with instructions for set-up of paper, and format instructions. Video Games, Violence, and Children - The purpose of this paper is to examine the impact of violent video games upon the behaviors of children. Exploring Classroom Management and Student Behavior Policies - Review district policies or other documents related to student behavior, classroom management. Weapons in Schools - Weapons in schools are part of the growing trend of school violence. Paper Masters writes custom research papers on School violence and examine the factors and causes of school violence in America.